Volunteers at the Webster County Relay Center for Operation Christmas Child at First Baptist Church of Mathiston. As of Sunday night, 4,482 lives will be impacted by the generosity of Webster County residents who are passionate about the Operation Christmas Child shoebox ministry. Final count Sunday night showed 4,482 shoeboxes collected at the Webster County Relay Center at First Baptist Church of Mathiston, up from 3,700 shoeboxes in 2013. Dewberry said 22 churches participated in this year’s event, in addition to individuals and families who dropped shoeboxes by the center throughout National Collection Week, Nov. 17-23. Rev. Wade Stevens, pastor of First Baptist Church of Mathiston said his church members have worked very hard on the Operation Christmas Child Project this year. And while the Operation Christmas Child ministry is coming to a close for most area churches, is it just beginning for area volunteers. 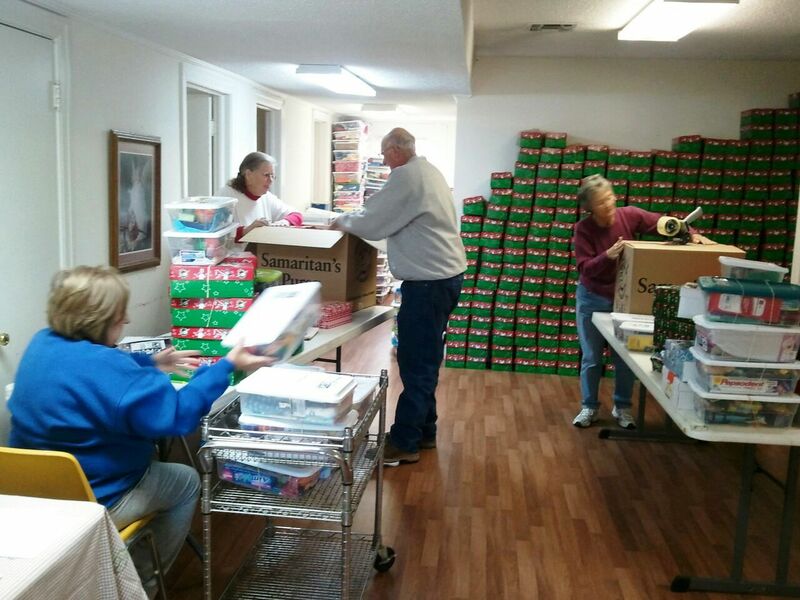 Dewberry and other volunteers from the Webster County Relay Center will be traveling to Atlanta, Ga. Dec. 1-3, where shoeboxes from throughout the Southeast will be checked and shipped to one of over 100 countries around the world. For more information about Operation Christmas Child, go to http://www.samaritanspurse.org/what-we-do/operation-christmas-child/.